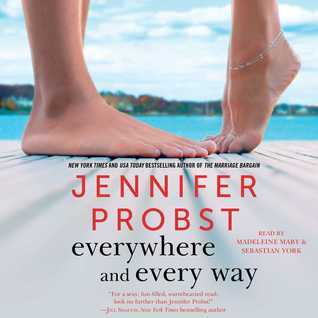 I have been a big fan of Jennifer Probst for a while. Her writing is so engaging and you can’t help but fall in love with her characters. Everywhere and Every Way was no different. In this book we get to meet all the Pierce brothers but we really get to know Caleb the best. After his father passes away unexpectedly it brings all the brothers together but with that comes years of bitterness and anger. Then they find out that they must work together to save their family business. You could see where there could be some problems right? Enter Morgan. She is a woman that usually gets her way and if she doesn’t get her way she isn’t afraid of manipulating people or things to get it. She needs Caleb’s help and when he doesn’t agree to help her things don’t go well for him. This sets the premise for a great hate to love story. I liked these characters right away. They were hard workers, responsible and not afraid to go after what they wanted. Their banter was very entertaining. It was totally laugh out loud worthy. I loved it! Caleb and Morgan were a perfect match to me but it took them a while to find that out. Their attraction and sexual chemistry could be felt throughout the whole story and I couldn’t wait for them to get it together but I loved all the obstacles that got in their way! This was a great lite hearted, low drama and funny romantic little love story!